WOW! The only place where you can buy Ripple for up to 20k USD per single transaction and in total for up to 50k USD per month. Best in class Online Consultants will guide you through the whole process, from creating a wallet to making a payment! Thousands of customers expressed their love and trust on Trustpilot giving us 9.2/10 rating. XRP is an independent digital asset developed by Ripple company. Paybis Offers safe and easy to buy XRP with Credit or Debit Card. Visa/Mastercard brands are supported. For the first time customer, on average it takes 15 minutes to complete the purchase including going thru KYC process. Paybis.com ensures that XRP is transferred instantly to your wallet right after your payment is approved. 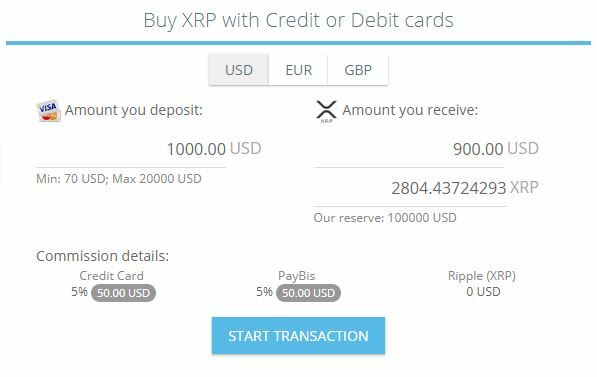 Buying XRP with fiat or regular money we recommend using your bank card as its the fastest and most convenient way. If you are still thinking about giving it a try, don’t hesitate, a lot of our clients have chosen to purchase cryptocurrency with credit or debit cards and given us a positive rating (9.2 out of 10 via Trustpilot). Setup your XRP wallet, we recommend Ledger or Toast. Please ensure that you have made required backups! While initiating a transaction you will be asked to specify your XRP Wallet, as well as TAG. 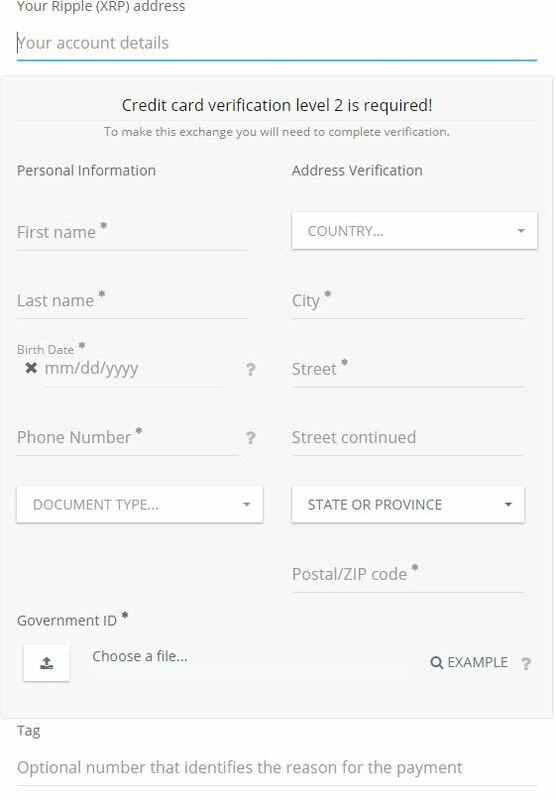 TAG is optional, mostly needed when transferring XRP to other exchanges. Please be extremely careful and ensure that XRP Wallet is correct and TAG is specified if required by your exchange. Paybis.com is one of the few places where you can buy XRP with your credit card online almost instantly. Please note, all your sensitive data is not stored securely on our website, Payment via credit card is done via secure page where it safe to enter your card details, the whole process is done in compliance with USA and EU laws. Paybis.com provides the best experience and value for clients. You can also use other different payment methods within Paybis.com to buy sell or exchange your digital assets. Select ‘Credit Card’ on the left-hand side of the Paybis home page and 'Ripple (XRP)' on the right. Then enter the $$ value you would like to pay in ‘Amount you deposit’ and then click "START TRANSACTION". Your Ripple (XRP) address - please ensure that your Ripple (XRP) address is correct, as all transactions are irreversible, and it will not be possible to change the address later on. First and Last Name - Should be exactly as they appear on your credit or debit card. If the name does not match, your transaction will be rejected. Date of birth - Please note, we can only offer our services to people aged 18 or over. Upload your ID document in good quality. All 4 corners should be visible, all text on the document should be readable. The better the quality, the higher the chance of getting automatic approval within 5 minutes. 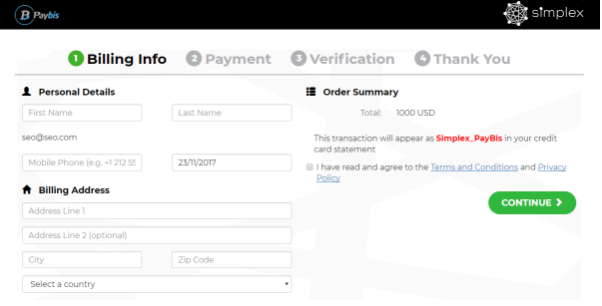 Next, you will be redirected to Transaction Details page, Please wait while your verification is reviewed. This usually takes 15-20 mins, but it could take up to 2 hours or more. Please monitor your mailbox. If your verification is rejected, you will get an email with a detailed explanation of issues needing to be fixed. Fill in your name, address and birth date again. Once your card has been validated and processed, your order is complete! Verification and processing usually happen within 5-120 mins. Please note: there is a probability that your payment will require a manual review. Therefore, please do not forget to monitor your mailbox for additional verification emails from Simplex. Do not hesitate to contact our Support team via chat or email if it takes more time.